It’s not often an early season matchup like this comes about, but Sunday’s Las Virgenes Stakes (GII) at Santa Anita pits the reigning champion juvenile filly Champagne Room against Unique Bella, who is the early morning line favorite off of two effortless wins in her past two starts. Unique Bella, owned by Don Alberto Stable and trained by Jerry Hollendorfer, debuted in late June last year as the 2-5 favorite, but could only manage second after breaking poorly. There was a five-month gap between that race and her second start, which assistant trainer Dan Ward said was intended to, “give her time to mature and let her mind catch up with her body.” The time off did what it was supposed to do as she was hand-ridden to a 10 ¼-length maiden win upon her return to the races. She followed up that victory with a 7 ½-length romp in the Santa Ynez Stakes (GIII) last out. Champagne Room was a $310,000 purchase at last year’s OBS April 2-year-old sale for owners Ciaglia, Exline-Border, Gulliver Racing, R. Christensen, D. Legan and S. Alesia. 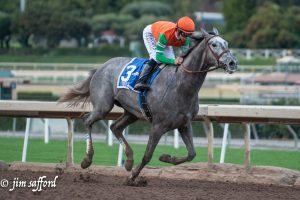 The Peter Eurton-trained filly debuted in July, finishing a strong second after breaking from the rail and being stuck inside throughout the race. The effort gave her connections enough confidence to enter her in the Sorrento Stakes (GII) while still a maiden and the somewhat bold move paid off with a powerful 1 ¼- length triumph over fellow Las Virgenes rival Miss Southern Miss. 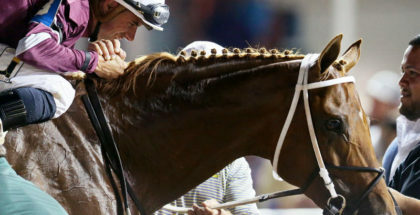 Her next two starts, however, did not produce the same success as she finished third in the Del Mar Debutante Stakes (GI) and fourth in the Chandelier Stakes (GI), which was also her first attempt around two turns. 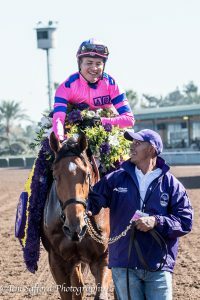 Whatever adjustments were made by Eurton between those races and the Breeders’ Cup did the trick, as the daughter of Broken Vow powered to a three quarter-length victory in the Breeders’ Cup Juvenile Fillies (GI) at odds of 34-1. That win was also enough to solidify her status as the best 2-year-old filly in the country and earned her the votes for the Eclipse Award as champion juvenile filly. Several of her recent works have come in the afternoons between races due to recent wet weather in California. The Las Virgenes field is rounded out by Peter L. Cantrell’s stakes winner Miss Southern Miss trained by Keith Desormeaux, maiden winner Mistressofthenight, who is owned by Beerman Family Trust, Sayjay Racing LLC, and Hall and trained by Richard Baltas, and Reddam Racing LLC’s grade-one-placed Mopotism, trained by Doug O’Neill. The Las Virgenes is carded as the 6th race on Big Game Sunday program at Santa Anita. Run at one mile on the main track, scheduled post time in 1:30 pm PT.